As it proceeded during the fall semester, The Harvard Campaign  featured a penultimate school’s launch (medicine); another galvanizing gift (computer sciences); and interesting evidence of the effects ofsmaller-scale philanthropy across the University, from undergraduate teacher-preparation training to a prospective College performing-arts program. Harvard Medical School (HMS) unveiled its $750-million campaign under that theme during a dinner in Boston on November 13. Dean Jeffrey Flier, the keynote speaker, recounted his own progress as a young researcher probing diabetes—his talk neatly encompassing school goals of educating leaders in science and medicine, discovering the causes of disease, and fostering change to improve human health. Education: $150 million to effect curriculum reform (an overhaul is to be introduced next year, with changes in pedagogy and accompanying physical renovations over time) and underwrite financial aid and fellowships. Research: $500 million. “If you look at the budget of Harvard Medical School and what the people we employ do,” the dean said, “the largest number of them are doing research.” But it “never fully pays for itself,” and is now under sharp pressure, as federally sponsored research funds become scarcer. Hence the emphasis on securing the research enterprise through the campaign. Innovation: $50 million. Under this umbrella phrase deans are employing in the campaign to cover discretionary funds and annual giving, which can then be deployed to emerging priorities, Flier highlighted “facilitating and seeding translational research,” like that conducted by the school’s new program in therapeutic science (see “Systematic Drug Discovery,”  July-August 2013). For further detail, see harvardmag.com/hms-15 . HMS’s goal is the third-largest within the campaign, after the Faculty of Arts and Sciences’ (FAS) $2.5-billion and Harvard Business School’s $1-billion targets. With the medical campaign made public, some $5.7 billion of The Harvard Campaign’s nominal $6.5-billion goal has now been disclosed. That raises all sorts of development guessing games. Will Harvard Law School, which unveils its fund drive next spring, be content to announce a lower target than, say, Harvard Kennedy School’s $500 million? If the Law School seeks as little as $400 million, can the central administration’s aspirations (which include atleast hundreds of millions of dollars to build the new Allston facility for most of the School of Engineering and Applied Sciences) actually be accommodated by the remaining $400 million nominally to be raised? Or is the $6.5-billion figure an artifice intended to top Stanford’s last campaign total—and a sum the fundraisers hoped to exceed comfortably, to accommodate known needs (not to mention those farther down on decanal wish lists)? If the latter, the bet appears to have been a good one, given the torrid pace of fundraising. Gifts received and pledged are well beyond the $4.3 billion announced as of last June 30 (see “Capitalizing,”  November-December 2014), long since augmented by the $350-million endowment gift for public health and other benefactions. Whether or not the goal is formally raised, the arithmetic suggests additional aspirations. Happily for the recording secretary, sprinting to keep up with such large numbers, there may soon be a homemade app for that. A gift from former Microsoft CEO Steve Ballmer ’77, announced the same day as the HMS dinner, will underwrite a 50 percent expansion of SEAS’s computer-science faculty, now with 24 ladder-track positions (tenured, associate, and assistant professors), plus associated lecturers and other teachers. Discussing the gift (its size was not disclosed; endowing a new full professorship at SEAS costs $6 million), Ballmer talked about readying the faculty for “the next era of computing” in fields such as machine learning and computational theory, which he saw as propelling “the next wave of innovation and research.” More broadly, he characterized computer science as “the operating system for innovation,” with applications not only in information technology but in humanities and social-science research, medicine, and elsewhere. David Parkes, Colony professor of computer science and SEAS’s area dean for computer science, who joined Ballmer in the conversation, sketched the potential for both fundamental and applied advances in virtually every other field of inquiry. 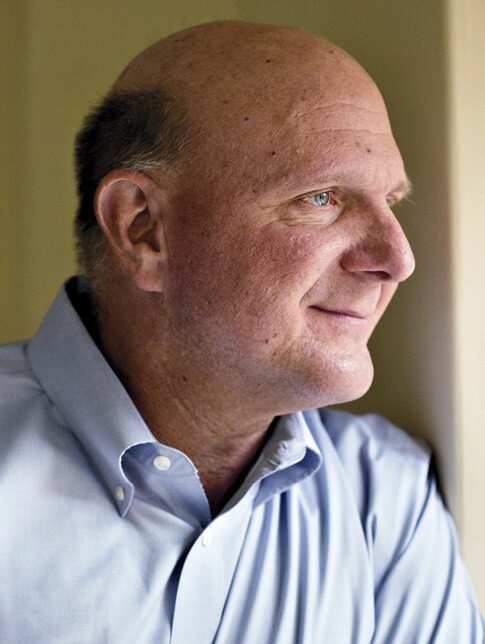 When a several-year process of recruiting and hiring is complete, and the enlarged computer-sciences cohort is rehoused across the Charles River, Ballmer said, Harvard should have ascended from the ranks of a “very good department” to top-tier status alongside such institutions as MIT, Stanford, and Carnegie Mellon. A comprehensive report on Ballmer’s gift and its implications for Harvard appears at harvardmag.com/ballmer-15 . The computer-science and other campaign-fueled SEAS growth; expansive claims for computational and applied-scientific analytics in pursuit of research in virtually every other area; and expanding ambitions for what FAS dean Michael D. Smith has called an “emerging research innovation campus” in Allston come at a potential moment of anxiety among the experts in those other fields Parkes referred to. Inflection point: undergraduate engineering and applied sciences concentrators outnumber those in arts and humanities. 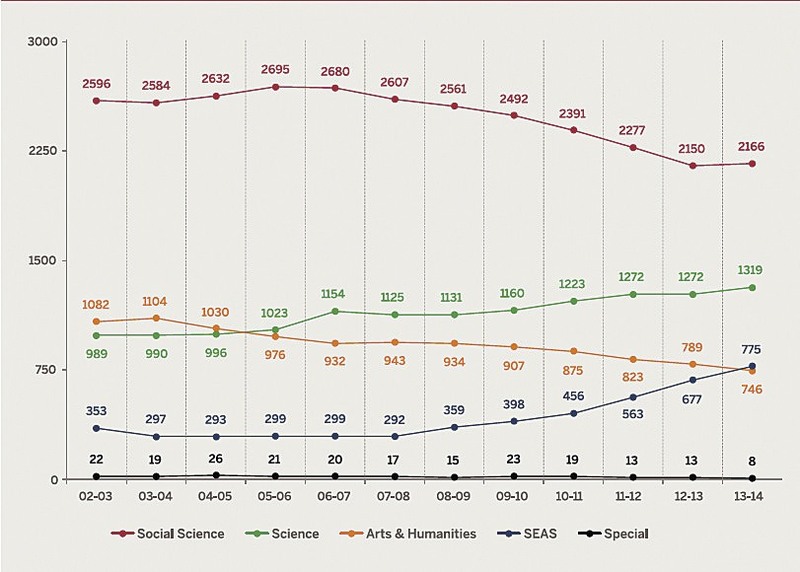 As Smith’s annual report for the 2013-2014 academic year discloses, the number of undergraduates concentrating in engineering and applied sciences (775) now exceeds those concentrating in arts and humanities (746)—a first for the College (see graph above). Those SEAS concentrators, and burgeoning enrollment in the school’s classes by students pursuing other major fields of study, are taught by 82 ladder faculty at the beginning of the current academic year (up from 77 in 2013-2014), while there are 196 arts and humanities professors. The student shift to engineering and applied sciences has been swift and profound; that demand for instruction, and perceived opportunities in research, underlie SEAS’s campaign plan for significant faculty growth, much of which Ballmer has now supported. By comparison, investment in other areas, welcomed by faculty members and students alike, is on a different scale (see below). In late November, the Association of American Universities (Harvard was a founding member, in 1900) joined academic groups from around the world to sign the Leiden Statement, the latest in a series prompted by the seemingly imperiled status of the humanities and other fields. Pledging support for the humanities and social sciences, the statement of purpose asserts, almost defensively, “Every challenge the world faces has a human dimension, and no solution can be achieved without enlisting the support and efforts of individuals, communities, and societies”—with nary a mention of apps or algorithms. A discussion of the changes in enrollment, faculty expansion, and related issues appears at harvardmag.com/fas-15 . Harvard has long been known for operating with “every tub on its own bottom”: a system that has empowered deans to steer their schools toward excellence in their fields, with control over endowments to match—but has also left successive presidents with relatively scanter resources. 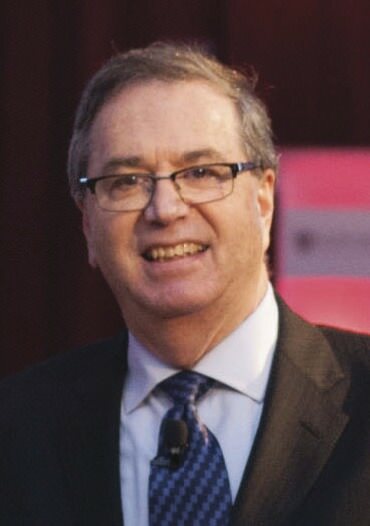 Under Neil L. Rudenstine, the University Campaign sought funds for central academic priorities, including several multischool interfaculty initiatives. The current Harvard Campaign, without spelling out such goals, has apparently bolstered President Drew Faust’s coffers. A gift unveiled at Radcliffe Day last May, for example, allotted $5 million for the arts, to be used at the president’s discretion (see Brevia , September-October 2014). Deploying the Massachusetts Hall balance sheet, Faust supported two initiatives in the days before the Ballmer announcement and HMS launch. The first, announced in late October, is $5 million in presidential seed funding for an undergraduate concentration in theater, dance, and media—an initiative envisioned in the Faust-commissioned task force on the arts, which reported in late 2008, after the financial crisis largely forced its recommendations to be shelved. The new FAS concentration (put in context by the Undergraduate columnist in this issue; see “An Undergraduate Life in the Theater” ) may start up in the coming academic year. More details will be forthcoming, but it appears that the program will operate without creating a formal department or augmenting the ranks of arts and humanities ladder faculty. For a full report, see harvardmag.com/tdm-15 . Two weeks later, the Harvard Graduate School of Education announced a $10-million anonymous lead gift toward the creation of a Harvard Teacher Fellows Program, a reconceived, expanded pathway for undergraduates to enter the teaching profession. That gift, additional financial support, and unspecified funds from Faust, summed to $14.5 million—sufficient progress toward the program’s $20-million goal for education dean James Ryan to proceed, beginning with seniors in the College class of 2016. Capacity will eventually rise to 100 fellows annually. The program will provide extensive training before fellows enter a classroom—more than they might receive, for example, through Teach For America—and, more notably, mentoring and support during their first developmental years as teachers. Talking about the venture, Faust said, “I’ve been excited about this for a really long time”—as it both accommodates student interests and joins larger efforts to offer more public-service opportunities to College graduates. Read a comprehensive report at harvardmag.com/tfp-15 .